"Good rates. The bed pillows were small and not that comfortable, and the hair dryer didn't work. The hotel clerk was accommodating and really helpful. It was nice having a shuttle to the airport.2018-11-20"
"There was no alarm clock in the room, and I didn't get my requested wake-up call. The cabinet door was hanging by one hinge, and the coffee table had a broken leg. The TV didn't work; I later discovered it was unplugged. Don't stay at this hotel.2017-07-23"
"The check-in clerk wasn't very pleasant, and guests had to wait for service because the front desk wasn't always manned. If you want robotic service without a smile, this is the hotel for you.2017-06-23"
"No vending machines at this hotel, so bring snacks and bottled water.2017-03-20"
"The hotel clerk didn't seem organized. I'll stay elsewhere next time.2016-10-11"
"Good experience, but the AC in my hotel room sounded like a motorcycle engine when it turned off.2016-09-27"
"The hotel room was spacious but shabby. No AC, but it wasn't really needed. The blinds wouldn't close all the way, so people could see in the bedroom, especially when the lights were on. This was a problem, especially since we were directly across from the elevator.2016-08-16"
"The room was clean, but I had to kill a cockroach. The hotel clerk was pleasant and helpful. OK breakfast, but the oranges were bad, and there wasn't enough seating. I don't recommend staying here.2016-08-08"
"We arrived at the hotel after check-in time, but there wasn't enough toilet paper, and there were no washcloths. The washcloths were quickly provided, but we were told to get toilet paper from the motel next door; this was not a satisfactory solution. The shuttle only served the west side of the hotel, which we didn't know.2016-07-30"
"Reasonable rates. The hotel room was comfortable, and I had no problem with check-in. Stay here.2016-07-26"
"The hotel was clean, and the continental breakfast included an omelet. I'd stay here again.2016-02-16"
"Great hotel experience, but there wasn't enough parking. I had to park on the street when I checked in at 6 PM.2015-10-28"
"The hotel was close to the airport. Excellent value.2015-10-06"
"Nice hotel. 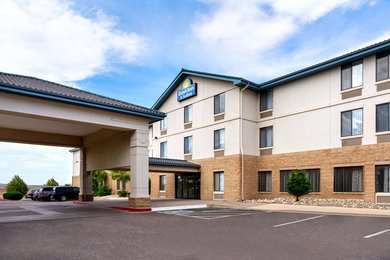 My room was comfortable and clean.2015-09-30"
"Easy to find and convenient to the airport. The hotel staff was helpful. Had an airport shuttle. You'll enjoy your stay here.2015-06-18"